The set captures the guitarist’s return to the rock stage for the first time in two decades this past June with a new lineup for a pair of Monsters Of Rock festivals in Germany and a third date in the UK. 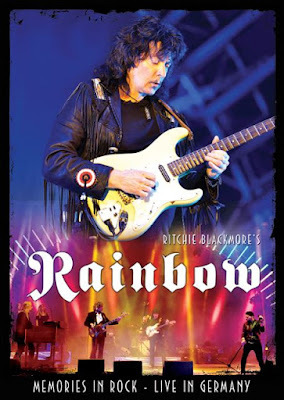 Blackmore was joined by Lords Of Black singer Ronnie Romero, Stratovarius keyboardist Jens Johansson, Blackmore’s Night drummer David Keith, bassist Bob Nouveau and backup singers Candice Night and Lady Lynn for the rare rock shows by the former Deep Purple legend. Blackmore last performed rock in 1997 while touring in support of Rainbow’s eighth album, “Stranger In Us All.” That same year he went on to form the medieval folk band Blackmore’s Night with then-girlfriend and now-wife Candice Night, and the group has gone on to release ten albums. “Memories In Rock - Live In Germany” will be available via DVD+2CD, Blu-ray+2CD and digital formats, with a deluxe version (DVD, Blu-ray and 2CD in a 48-page hardback photobook) and a 3LP version (180-gram vinyl) due on December 2. "Memories In Rock - Live In Germany"